Five members of the Sarasota Sailors signed this week! College baseball is where it’s at. The chance to get an education and still continue your playing career against the other college elites is something that most any high school baseball player dreams about. For many of them, that just became a reality. 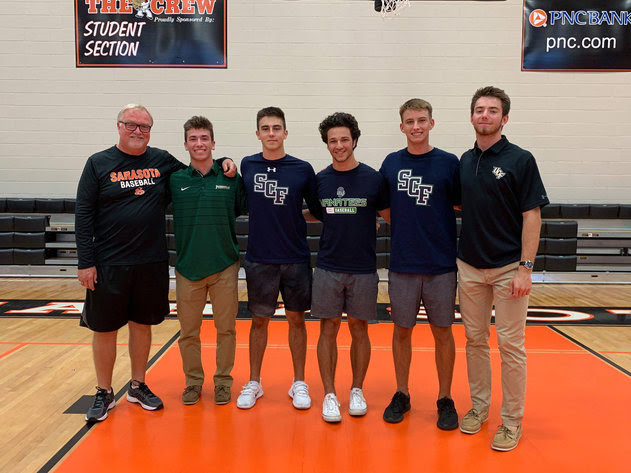 Across Florida and the nation, this week marked the culmination in realizing that dream to play collegiate baseball, as high school seniors signed their letters-of-intent during National Early Signing. As is always the case, there was no shortage of Florida ball players that seized their moment. Often enjoying a special ceremony with many eyes anxiously watching, this week enjoyed countless celebrations as each future college baseball player put their ink on the paper. This is a special moment and no amount of photos or press clippings can equal the joy shining from proud parents, coaches and family. Be it in an auditorium, media room, gymnasium, private office or perhaps the coaches office, it means a lot to see the players dressed to impress center stage for his moment. So many kids do not get the opportunity to go to college, and many times the parents themselves sacrificed that opportunity in hopes instead of this day. This is a memory that will be cherished for years to come. “First and foremost, I would like to thank God for giving me this opportunity. I would like to thank my family, friends and coaches for helping me along the way,” said Booker T. Washington Wildcat Hunter Noblitt, who signed with Seminole State College. 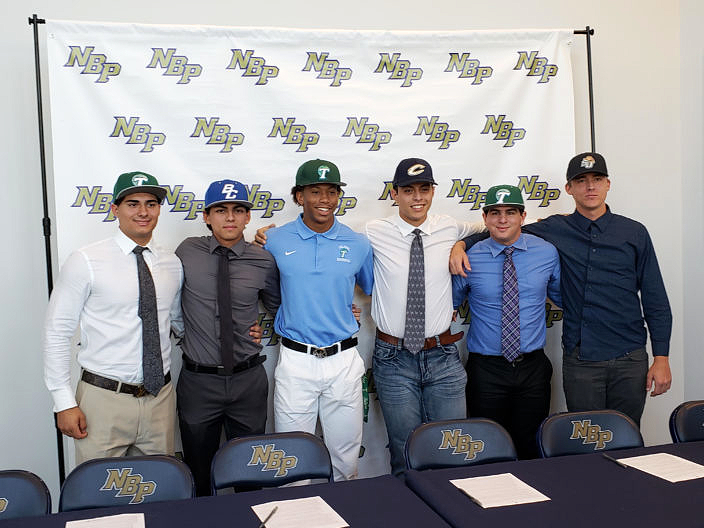 North Broward Prep’s Liam Cogswell, Dylan Goldstein and Matthew Corlew signed with Tulane University, while teammate Gabriel Esquivel signed to Chipola College, Chase McBean with Broward College and Anthony Tomczak to Stetson University. Noblitt’s fellow teammate Colby Livingston also signed with Embry Riddle, as part of a large group of signees from the Panhandle region. State champions had a strong presence this week. Class 4A state champion Calvary Christian-Fort Lauderdale had seven players sign, Class 8A state champion St. Thomas Aquinas had six and Class 7A champion Venice had four. Class 9A state champion Jupiter celebrated three signings. At Taravella, new manager Joe Giummule enjoyed the privilege of already having three players sign. Justin Diaz signed with Oglethorpe, Robert Pokorney to Florida Southwestern State College and Cosi Scinta with the University of North Alabama. Many more signees are also yet to come later this year. New players commit every day, such as Lennard’s Yazael Nunez, who recently committed to St. Leo University. Many will wait until the spring, and others are like Ponte Vedra’s Carter Page, who has committed to Daytona State College and will sign in January when the junior college signing period begins.